Brand new spot, Southern USA, Very competitive $$, Like vehicles? 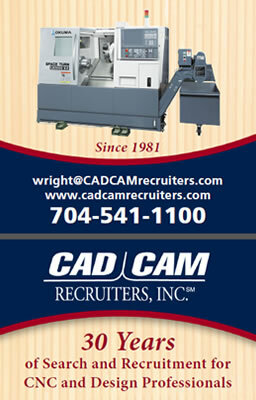 Resume in confidence to: bw@cadcamrecruiters(dotcom) serious inquiries only please. As a key member of product development, you will be responsible for creating 3D surface or solid models of OEM parts via reverse engineering, and subsequent mold design and extrusion dies; programming CNC machining centers 3-5 axis and wire EDM equipment to facilitate mold construction. • Study sample products or drawings to determine design approach, tolerances, sequence of operations, material and programming requirements. • Select or design holding fixture, cutting tools, attachments, and materials.